Each time you are paid, a direct deposit paystub provides a statement of your earnings and deductions for that pay period. Beginning in October, your paystub will have a new look and more information about earnings and deductions. Your redesigned paystub will still show accurately calculated earnings, withholdings of any applicable taxes and withholdings for payroll deductions that apply to you. Nothing about your pay is changing, but your paystub will look different. 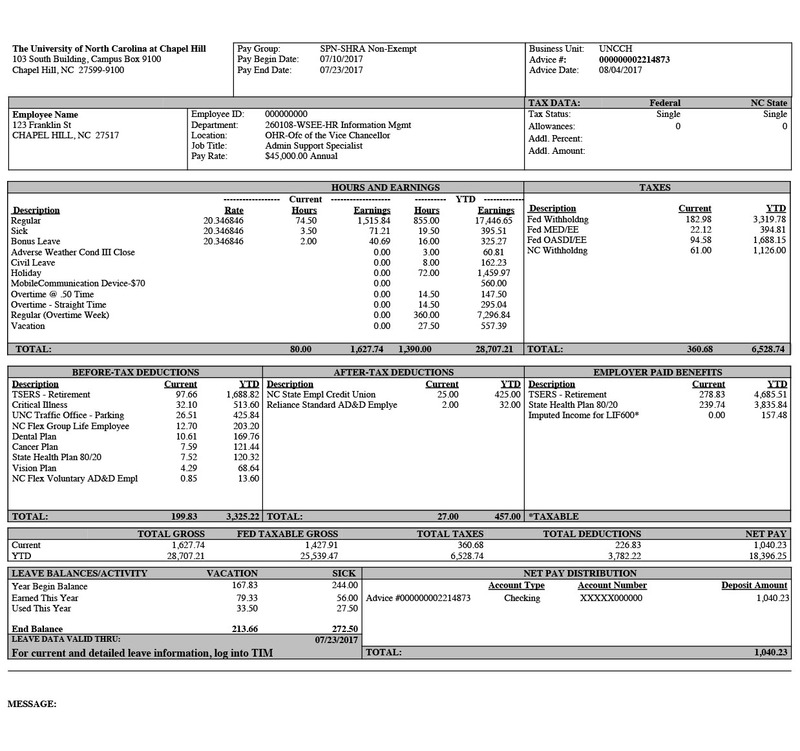 Click the image for an enlarged view of the paystub’s new look. All additional pay and allowances beyond base pay will be listed on the paystub. All employer-paid benefits will be listed on the paystub, and it presents a more complete view of compensation. This new section shows what the employer pays on the employee’s behalf, for example, for health care and retirement contributions. Also in this section are taxable fringe benefits (such as employee gifts, prizes and awards), taxable stipends and allowances. The new stub displays tax consequences of benefits deductions, which then informs the Federal Taxable Gross, which is not on the current stub. The Federal Taxable Gross provides you with a total for the year that will match box 1 on your annual W-2 form. You will know what to expect from your annual W-2 by reviewing this information. The new stub will label leave balances and activity information, making the information easier to understand. Your leave information was previously in the upper right corner of the paystub. The new design will include the date for which the leave is valid through, so that it is easier for you to determine how much leave you have earned and used this year. TIM is the system of record for all leave balances and activity. A new quick-reference guide, Viewing Accruals in TIM, is coming soon. For the most up-to-date leave information, access TIM. Click the image at right for an example of the new paystub look, or download the paystub example in PDF. Read the memo explaining the paystub changes and print, display and share the letter-sized poster explaining the new information available in your paystub in ConnectCarolina. 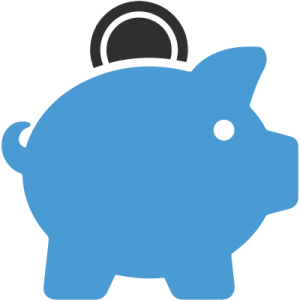 To access your pay information, go to ConnectCarolina and select “Login to ConnectCarolina (faculty, staff and alumni).” Use your Onyen to log in, and click on the SelfService tab on the left. Select “View Paycheck” to see or print your most recent paystub. 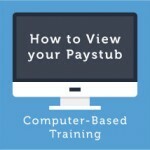 You may want to view this Computer Based Training (CBT) on Accessing Your Paystub in ConnectCarolina. If you have issues accessing your paystub, please contact your School/Division HR Office for assistance. A letter-sized poster explaining how to locate your paystub in ConnectCarolina. Please print, display or otherwise share with staff/colleagues. Q: When will employees get the first paystub in this new format? A: Paystubs issued in October will be in the new format (Oct. 13 and Oct. 27 for biweekly pay dates, Oct. 31 for monthly pay dates). Q: Will the way to access paystubs change? A: No, employees will still access paystubs in ConnectCarolina as usual. View the How to Access Your Paystub section for more information. Q: Where can I access Bonus Leave information? A: Current and detailed leave information — including Bonus Leave — is available in TIM which can be accessed through ConnectCarolina. Q: The word “Advice” is used in several boxes of the paystub. What does “Advice” mean? A: A payment advice is a statement of your earnings and deductions. In this case, the paystub is a payment advice that details a direct deposit transaction. You may also see this term used when you receive a reimbursement by direct deposit. Q: In the Hours and Earnings section, how is Regular different from Regular (Overtime Week)? A: Hours worked during a normal 40-hour week will show in the Regular line. If you work more than 40 hours in a week, you will see the 40 hours on the Regular (Overtime Week) line. The TIM system tracks work week hours 0-40 separately from work week hours over 40. Actual overtime hours will not show on either of these lines, but will show on one of the two overtime lines (Overtime @ .50 Time or Overtime – Straight Time) depending on the way overtime is accrued. Q: How will I know what benefit plan premiums/deductions are paid on a before-tax or after-tax basis? A: The Benefit Plan Deduction Tax Status Guide provides details and the description as it appears on your paystub. Q: At the bottom of my Hours and Earnings section, there is an item called “Other.” What is that? A: If you have more earnings or benefits than can be displayed on the paystub, the additional item amounts are totaled at the bottom and described as “Other.” The paystub sections have 12 lines available for item descriptions, so if you have more than 12 item descriptions in a box, you will see an “Other” item. Q: On my monthly paystub, what does the YTD Hours calculation mean? A: If you are paid monthly, the YTD Hours data on your paystub is actually a system calculation of calendar days x 8 hours. Q: I am a SHRA non-exempt employee. Why is the vacation or sick leave hours in the Hours and Earnings box different than the hours presented in the Leave Balances/Activity section below? A: The information in the Hours and Earnings box is a total of all Hours and Earnings for paychecks issued during the calendar year 2017. In 2017, the first two biweekly paychecks issued included hours worked after December 12, 2016. Any hours coded during the last two weeks of December 2016, such as vacation for the University Closed Day, are included in the Hours and Earnings box. The Leave Balance/Activity section reflects time as of January 1, 2017.